This weeks Three Clover Thursday Challenge is - use purple, glitter and create a birthday card. Kerry's birthday is next week - so stop on by and wish her a Happy Birthday! If you follow my blog, or check in on occasion, you know Glitter and Purple are hardly ever used - so this indeed is a challenge. Time has been limited these days, so I'm going for another one of those 5 minute KISS cards....okay - maybe 10 because I have to allow dry time for the stickles. I used my Stamp-a-ma-jig to stamp the flourish from Friends 24-7 in black all over my purple card stock, then added my Tiara Stickles. 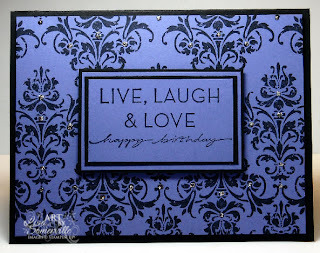 The sentiment is stamped in black then layered as shown on black and purple card stocks. Both the purple layer and the sentiment layers were popped on dimensionals. Heehee...Glad that SOMETHING is a challenge for you! You know what? I don't really use purple on my cards either! LOL! THis came out FABTASTIC! Your cards always do...5 minutes or 5 hours. Love the background of the card, kind of reminds me of chandeliers with the design. Wow! Love the background you created. Believe me I am (challenged) when it comes to using the Stamp-a-ma-jig so I envy your talent using that for sure. Great pattern that really pops out. FOr a quickie card, it sure is nice. You did a fab job for someone who was challenge. Great card lisa. Very pretty Lisa. I so love all the things you are doing with that set! Very classy! Love how elegant this card turned out! What a great card, and you have a wonderful blog here! So many beautiful and interesting projects on display!